Every month on Earth Matters, we offer a puzzling satellite image. The August 2018 puzzler is above. Your challenge is to use the comments section to tell us what we are looking at and why this place is interesting. How to answer. You can use a few words or several paragraphs. You might simply tell us the location. Or you can dig deeper and explain what satellite and instrument produced the image, what spectral bands were used to create it, or what is compelling about some obscure feature in the image. If you think something is interesting or noteworthy, tell us about it. The prize. We can’t offer prize money or a trip to Mars, but we can promise you credit and glory. Well, maybe just credit. Roughly one week after a puzzler image appears on this blog, we will post an annotated and captioned version as our Image of the Day. After we post the answer, we will acknowledge the first person to correctly identify the image at the bottom of this blog post. We also may recognize readers who offer the most interesting tidbits of information about the geological, meteorological, or human processes that have shaped the landscape. Please include your preferred name or alias with your comment. If you work for or attend an institution that you would like to recognize, please mention that as well. Recent winners. If you’ve won the puzzler in the past few months or if you work in geospatial imaging, please hold your answer for at least a day to give less experienced readers a chance to play. Releasing Comments. Savvy readers have solved some puzzlers after a few minutes. To give more people a chance to play, we may wait between 24 to 48 hours before posting comments. Answer: About two billion years ago, an asteroid hit Earth southwest of what is now Johannesburg, South Africa, and formed Vredefort Crater—the world’s oldest and largest known impact structure. Layers of upturned rock eroded at different rates and produced the concentric pattern visible in the image above. Congratulations to Felix Bossert and Tom for correctly identifying the feature. Read more about the image in our September 1, 2018, Image of the Day. This entry was posted on Tuesday, August 28th, 2018 at 3:45 pm and is filed under EO's Satellite Puzzler. You can follow any responses to this entry through the RSS 2.0 feed. You can skip to the end and leave a response. Pinging is currently not allowed. Hogback ridges (maybe the part of the ‘Grand’ Hogback in Colorado, or a east to west look at hogbacks on the western side of the Black Hills). Tectonic plate collisions in central Asia. It is aerial photography of path left out by meandering river at a dry reigon somewhere in between the tropics; exact location is not known to me. Mining company Rio Tinto’ s Bingham Canyon Mine, otherwise known as Kennecott Copper Mine, is one of the largest man-made holes in the world. Located outside of Salt Lake City, Utah, the copper mine has been in production since 1906 and produced more than 19 million tons of copper in its lifetime, including millions of ounces of gold, silver and molybdenum. Fimiston Open Pit, otherwise known as the Super Pit, is a canyon-size mining operation – measuring two miles long, a mile wide and almost 2,000 feet deep — producing hundreds of thousands of ounces of gold each year an is located Kalgoorlie in the barren landscape of Western Australia. This is a true color image rich with geological features. It is a small part of huge, folded beds of, most probably, sedimentary rocks. We can see at least three ridges swinging as they trend east-west. These ridges are of a harder (more resistant to erosion) rock, probably limestone-dolomite (because of the darker color). Shifting can also be observed in the ridges due to lateral faults (most prominently in the center of the image in the northernmost ridge). A stream has carved a narrow valley which runs along the fault line. Two more streams can be seen running along fault lines in the extreme left and right of the image (shifting of the ridges can also be seen along those faults). Looking at the farmlands and vegetation in the image, it appears to be an arid or semi-arid region. 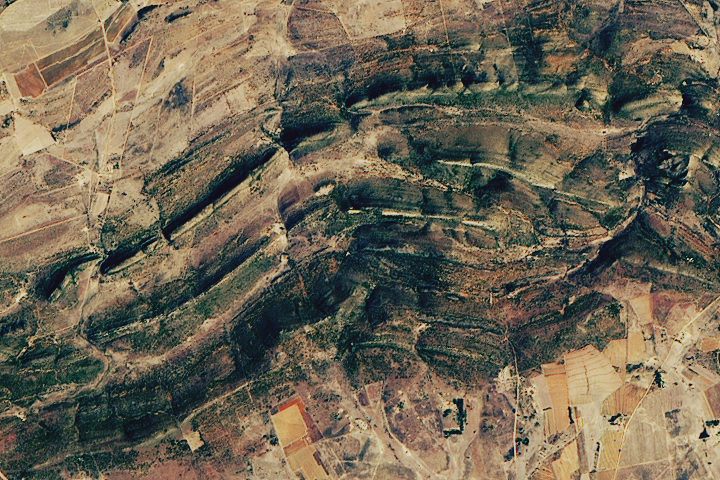 The geographic location of this image can be anywhere from the world where folding can be observed in the sedimentary strata such as Atlas Mountains (North-west Africa), western China or somewhere in Anatolia. Can’t be the Great Canyon, there are crops fields around.. I’ll say southern Spain, eastern Turkey, any north African country or any country with a desert closer to it but also agricultural activity. It looks to me like the remnants of a vast mining project. However, it may be an optical illusion I’m seeing agricultural areas at the top of the picture. It’s too big I think to be a Welsh slate mine. Looks like fold structure with a fault running through it, at right. I’ve seen similar terrain on the southern side of the Cantabrian Mountains of Spain. E.g. Near Aguilar de Campoo – 42 45 N, 4 12 W. Close ? This looks like an escarpment, with the higher ground in the top of the picture and the lower ground at the bottom. The climate is clearly quite arid, as the vegetation is sparse and the streams are dry and the stream beds not well defined. There is more evidence of agriculture in the bottom of the picture (lower ground) than in the top (higher ground), but otherwise not much infrastructure, except some dirt roads. This could be anywhere in the mid latitudes on the northern or southern hemisphere. Australia, or southern Africa, or the southern US? Looks like south – eastern Phoenix area or eastern edge of Tucson. Farming in the bottom of the picture with hills (some may call them mountains) forming ridges in the middle of the picture going back to an arid ranching environment. Now that I see the answer, please also publish coordinates so topography and other info available. Seems strange that those strata were beyond the area of shatter and held together while being suddenly rotated. Keep comments relevant. Inappropriate or offensive comments may be edited and/or deleted. Avoid adding Web site urls.